Today is the 25th of November, meaning it is exactly 1 month till Christmas. Thinking about it, that’s not a lot of time to get everyone’s Christmas presents sorted. Because you have so many presents all at one time, the problem I find is not so much of the actual shopping, but the thinking up of new and unique ideas. But unique doesn’t have to mean expensive. I’ve noticed a lot of Christmas guides around the blogosphere that are great, but a little out of my price range when I have 10+ presents to buy for. So I thought I would try and offer an alternative perspective. I’ve got a very simple idea that can be re-used for lots of different presents. Be prepared to get put some time in and be creative, but the results are worth it. 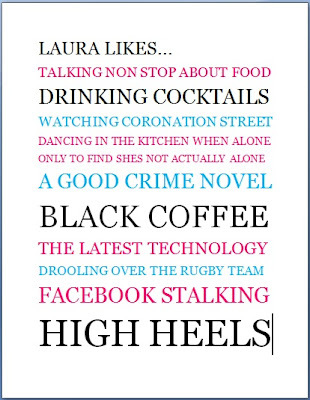 I saw on ‘Not on the High Street’ a fantastic Personalized 'Likes' Poster Print. I think it’s a great idea as it shows you really understand the person you’re buying for. Plus you can make it as witty or as silly as you like. However, at £38 I thought it was rather pricey. Looking at it though, it is something you could quite easily do yourself. Design your poster on word. Start my typing out each new like on a new line, in a font that you like. Make the alignment ‘Justify’ and then go through and resize the text so they fit on one line. This is trial and error, but just keep upping the numbers till looks right. You’ll probably have to either add or remove likes to make sure it fills the page. The screen shot is a quick example of one I wrote on Word. You can obviously change the font, the colors and add more likes. But I did mine in about 5 minutes, so it is very easy, but the more time you spend, the better you can make it look. Print. I’d recommend doing a dummy run first on some cheap paper to make sure you like it. Don't want to waste good paper, when we are trying to save money! Then once happy, print in out on the best quality settings. Insert it into your chosen frame. This is where you can get a really nice frame to match your friend/ family. You could even get more creative, and customize it, with embellishments if you’re particularly creative, but even on its own, it looks really good. What ever the idea you have, it is something personal to the person you are giving it to, plus it’s a really cheap idea, as I’m guessing you already have the computer, word and a printer. The paper might cost around £5, but in that you’ll get multiple sheets. Then the frame can vary due to how fancy you want, but effectively you could pick up one for about a fiver. So potentially you can be spending £6 per present! Now after you hard work, go use that saving to treat yourself! 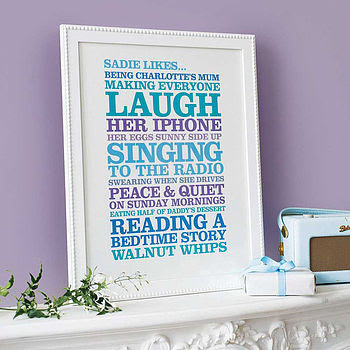 wow this is a perfect idea for a present! really love it:) thanks so much for sharing! That is such a thrifty idea, you're right, the original is really overpriced! I'm your newest follower, anyone who can save me that kind of money is alright by me! Thanks so much! I just made one and it looks fab!